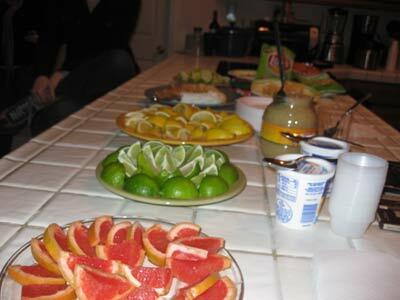 About a month ago, Alisha hosted a "Miracle Fruit" party at Nick's house. I had read about these perception-altering fruits on Boingboing, and to be honest, I was a little skeptical. The name of the fruit is actually "Miracle Fruit" (Synsepalum dulcificum). 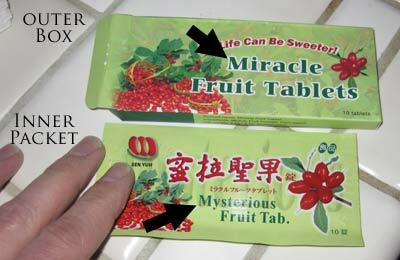 Who names a fruit "miracle fruit"? That is a terrible name! The claims were intriguing. The naturally-occurring chemicals in these African fruits were supposed to temporarily modify the way that your tongue tastes food. Sour things, it was said, would taste sweet. They were like rose-colored glasses for your mouth. Plus, the pills can transform water into wine and raise the dead. Alisha ordered two ten-packs of Miracle fruit tablets off of the internet. I think they were $20 for a pack of ten, plus smuggling shipping. The tablets were probably compressed freeze-dried fruit, and the goal was not to swallow them, but to let them dissolve/disintegrate on your tongue. The pills were over-packaged, apparently to disguise the odor from border-patrol strike teams. 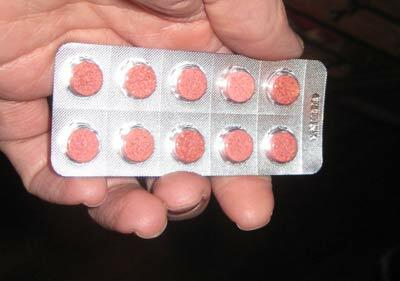 The blister-pack of pills was held inside a Chinese-branded foil packet, itself contained within a paper box. 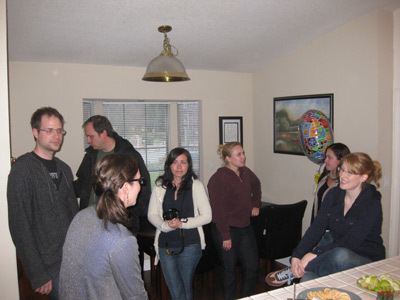 At 6 pm guests piled in and beheld perhaps the sourest spread of snacks ever: a smorgasbord of vinegar chips, sour cream, limes, grapefruit, sauerkraut, sour gummy candy and limes. 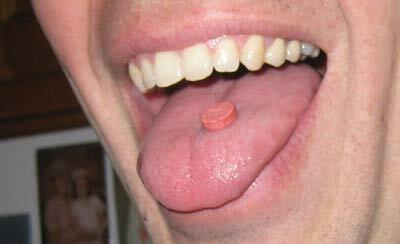 Once everyone had arrived, Alisha handed out the pills and we each began sliding one around on our tongues. The pills were sweet and a little slippery. They slowly disintegrated. The miracle pills totally worked! Limes were the most impressive. Not sour at all. 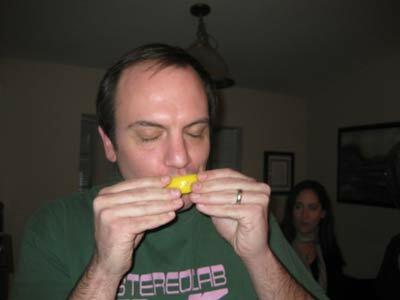 As an experienced lime-eater, when you bite on a lime, you brace yourself for the bite of sourness. 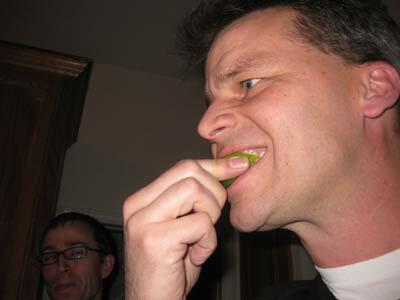 After eating a miracle berry tablet, the sour was absent, replaced by a subtle sweet taste. They weren't exactly like an orange, but they had the texture of an orange with a non-sour lime taste. I ate about six slices of lime. Lemons were no longer sour. 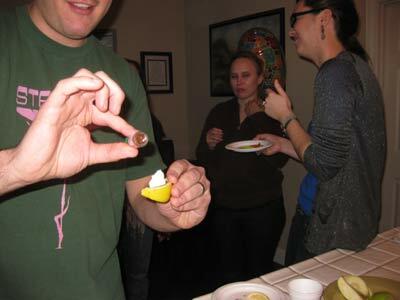 Sour cream was not sour but was not particularly tasty either. Ditto sauerkraut. 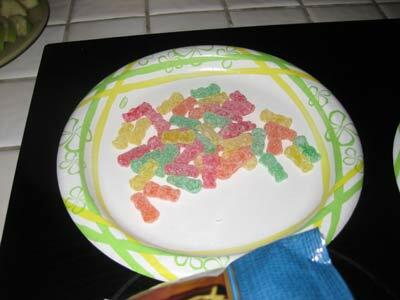 Vinegar chips were just salty and sour gummy bears were rendered inert. It was a very interesting experience! In addition to the taste-bud toggle, eating the tablet delivered a pleasant light-headed feeling. I felt good! A quick poll revealed that only one other person (Alice) felt light-headed, so that was probably just the rush of scientific discovery. These tablets would be great for a second date or a corporate event. The effect of the pills seemed to wear down a little with each taste until it was mostly gone 30 minutes later. 30 minutes was long enough. My life had changed forever. Food no longer has a flavor to me. It has a flavor because my tongue, lips, mouth and brain assign it that flavor. Chocolate is not delicious. It is a shortcut to the deliciousness that is already trapped in my sense-memory. I need only to tap into that mental flavor reserve to experience all the joy of chocolate. 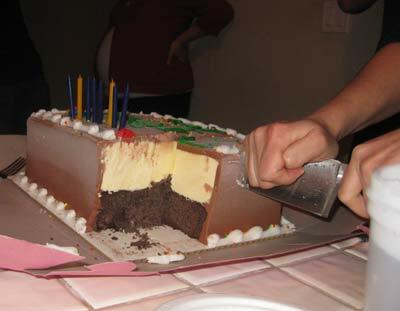 Speaking of which, there was also ice cream cake at the party in celebration of Leon's Birthday! My world has expanded. The world is new, and twice as large as it once was. This truly is a miracle. Also, my scurvy has vanished! Which fireworks are the loudest?